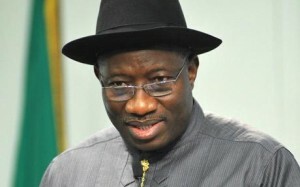 President Goodluck Jonathan on Friday approved the N4.697 trillion budget passed by the National Assembly and signed the 2012 Appropriation Bill into law. The amount excludes the N180 billion earmarked for projects under the “SURE” Progamme. He stated that the total federal government revenue forecast is N3.561 trillion based on a benchmark oil price of US$72 per barrel. Speaking in his office, he stated that any heads of Ministries, Departments and Agencies going to canvass for more funds for his ministry after the budget had been passed would not be tolerated, as this would lead to distortions in the budget. He also warned that any caught doing so would be “used as an example”.